As used and by my Dad! Save over 75% off your laundry bill and help save the environment! 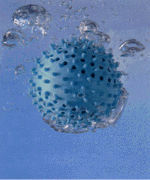 The Aqua ball produces ionized oxygen from the super charged laundry pellets which are inside the Aqua ball. This increases the pH level of the water in your wash, and activates the water molecules. These then penetrate deep into the fibres of your clothes lifting dirt away without damaging the fabrics. Clothes are washed sparkling clean, fresh, and soft and without the residuals of harsh detergents. It's kind to both you, your family and the environment. With no harsh chemicals it provides a gentle safe wash for babies and adults with sensitive skin or allergies. It's anti-bacterial properties helps to destroy both E-Coli and Staphylococcus. It is also biodegradable and non-polluting and saves on wasteful packaging. 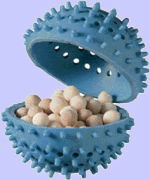 Each Aqua ball lasts over 60 washes, you get two balls and two sets of replacement pellets. This amounts to about 6p a wash. Less than a quarter of the price of traditional liquids and powders which can work out at between 20p - 30p a wash. The Vortex Energiser is a spiralling copper, silver or gold plated device. It contains highly energised water, which has been prepared using an innovative new process called implosion. Colloidal Silver Maker & Replacement Rods - Colloidal Silver is broadly acknowledged as a universal agent for killing bacteria, viruses and fungi. The Tongue Cleaner Enjoy fresh breath, restored taste and improved oral hygiene. Tongue cleaning is nowadays recommended by the British Dental Association but was first used in this country in the 18th Century. Crystal Deodrant Stone & Spray - The deodorant stone works by inhibiting bacterial growth on your skin, not by masking odour or blocking pores as many modern deodorants do. No bacteria means no odour.